Swansea Museum is a real treasure house of the ordinary and the extraordinary from Swansea past and present, and is a focus for the future of the city and its people. The Museum has many boats in its collection and three of these are kept floating in Swansea Marina. Lightship 91, known as 'Helwick', spent much of its life warning ships about the Helwick Sandbank in the Bristol Channel. Visitors can visit most parts of the boat to see the crew's quarters, a view into the engine room and the upper deck with its all important light. A tug boat called 'Canning' was built in 1954. She is an oil-burning steam tug who worked from Swansea Docks from 1966. She retired to the Museum in 1975. There is no public access to Canning but she can be seen clearly from the pontoon and dockside. 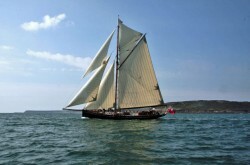 Our third floating vessel is 'Olga', a Bristol Channel Pilot Cutter built in 1909. This type of fast boat was used to take pilots out to larger ships to guide them through the difficult waters of the Bristol Channel. Like 'Helwick', 'Olga' is an important and rare survivor from a past time and is listed on the National Historic Ships Committee Core Collection list. Access to the boats is possible in June, July and August. The entrance to the pontoon is on Museum Square, near the Waterfront Tavern. The pontoon is accessible to wheelchair users, but unfortunately none of the boats are accessible. Other vessels are kept at the Museum's Collections Centre including two lifeboats; the Naomi Beatty and the William Gammon. CAMBRIA is a wooden Thames sailing barge, built at Greenhithe, Kent in 1906 by the Everard family. She is famed as the last British registered vessel to carry a commercial cargo under sail alone (until 1970) and as such forms a unique part of our industrial and maritime heritage. Now based at Pin Mill where her last and legendary Captain, Bob Roberts lived. As well as managing a small fleet of heritage vessels Cremeyll Keelboats provides a series of educational services and activities. Through the provision of training in seamanship skills and boat repair & maintenance, the students and trainees acquire the knowledge required to increase one’s self-confidence, make independent assessment and deliver self-contained management. Footrope Knots sells a variety of handmade ropework by Des and Liz, as well as the books tools and materials for others to create their own work. They also maintain the Museum of Knots and Sailors’ Ropework which is open by appointment. It is crammed full of interesting items and has the largest display on the subject in the UK. Hermitage Community Moorings (HCM) is a co-operative which owns and operates a mooring on the Thames at Hermitage Wharf, Wapping. The mooring provides berths for up to 20 vessels: enabling a mixture of live-aboard, recreational and visitor use. The Club, formed in 1966, is passionate about working boats, traditional skills, the waterways, the built heritage, and the practices and courtesies of the working boat people. The Club organises its own events which are generally free to enter and often holds rallies in conjunction with other organisations. The Newport Medieval Ship was discovered in the banks of the River Usk in June 2002 during construction of a new theatre. The ship was excavated by a team of archaeologists and lifted from the ground timber by timber. The OGA aims to preserve interest in and encourage development of gaff rig sailing. Join if you are interested in sailing, building; restoring or just admiring gaff rigged and other traditionally rigged craft. Kingswear Castle is coal-fired paddle steamer that dates back to 1924 - an age when a trip on a paddle steamer was prized for its health giving properties of wide open decks with plenty of fresh air. Until recently operating from Chatham, Kingswear Castle still provided that opportunity and will continue to do so from 2013 from her new base on the River Dart. Medway Queen entered service on the Strood-Chatham-Southend-Herne Bay route in 1924. After acting as a minesweeper in WWII, she returned to civilian life and later was used a nightclub on the Isle of Wight. After being abandoned semi-submerged there, she was returned to the River Medway in 1984. Efforts to preserve her have resulted in a new hull being built and Medway Queen is currently being fitted out at Gillingham Pier. Formed by a group of local fishermen and boat enthusiasts QWA aims to preserve and restore the Connah’s Quay dock area and to bring people to the River Dee to enjoy it and appreciate its past. The Kathleen and May Community Centre has been established and two wheelchair accessible boats provide trips on the River Dee. Sea-Change provides residential opportunities for young people and vulnerable adults to learn and develop in a unique environment. That unique environment is currently the Thames sailing barge Reminder and by living and working together aboard this traditional sailing vessel they participate in a wide range of life skills and are encouraged to take increasing responsibility for their contribution and group decisions. Based in South West England, we encourage interest in all aspects of maritime history and promote research in these fields. The Steamship Freshspring Society aims to return SS Freshspring to operation, preserving the past and inspiring knowledge for the future. SS Freshspring is in the early stages of being sympathetically converted to carry cruise passengers in comfortable well appointed cabins along with seafaring cadets or volunteers accommodated in dedicated cabins. The "Shieldhall" is a Heritage ship included in the National Historic Ships Core Collection and is generally recognised to be the largest working steamship of her type in Britain and probably Europe. The ship is of special interest as she was built on older classic lines with a traditional wheelhouse, of riveted and welded construction with a straight stem and a cruiser stern. The Steam Tug Kerne is operated by The Steam Tug Kerne Preservation Society Limited, a Charity set up to promote the preservation and maintenance of this historic vessel. Swansea Museum is a real treasure house of the ordinary and the extraordinary from Swansea past and present. The Thames Sailing Barge Trust is a registered charity that exists to preserve two Thames barges - s.b. PUDGE and s.b. CENTAUR - in sailing condition. In 2018 TSBT celebrates its 70th year of operation. Nancy Blackett was the favourite yacht of Arthur Ransome, the author of "Swallows and Amazons", and is now owned by the Nancy Blackett Trust, preserving her as a living part of the Arthur Ransome heritage. The Steam Boat Association of Great Britain (SBA) was formed in 1971 to promote the enjoyment of steamboats and to represent the interests of steamboat owners. The VIC 56 is an eighty-five foot steam ship, built in 1945 as part of the wartime shipbuilding program, and now preserved in working order by a small group of volunteers. She is moored at Chatham Historic Dockyard, on the River Medway in England, and is operated in steam a number of times each year, often to the Thames estuary area. The society formed in 1984 is based in Pembroke Dock, where there is a workshop aimed at encouraging the preservation particularly of craft of local interest. The WBTA provides a focal point to identify common objectives, interests and needs of the wooden boatbuilding industry, and also set about promoting those interests for the mutual benefit of those actively involved in the industry.